Each year there are many new students starting at KPS. Some of our students come from other countries and arrive in Australia with little or no English. They find themselves having to adjust to a new place, new home as well as a new school. I asked some of the Year 6 EAL students for their reflections on being at Kew Primary School. Question: Can you tell me how you felt when you started at KPS and how you feel now? I felt really scared and alone. But now in Yr 5&6 I have made a lot of friends and I feel very comfortable. At first I didn’t know English at all and with help from EAL teachers (Nat, Patricia, Ali) and reading lots if books with them I feel proud of myself that I can speak really well now. I feel comfortable to explain things to the teacher but not the whole class yet. I felt like ‘What kind of lessons do we have?’ I could speak a little English and they could still understand me. I am good now at KPS. I really like Interschool sport and Targeted Maths. I felt afraid because in China everyone looks different. Here there were not as many friends but if they spoke Chinese I didn’t feel scared. One year later I feel good. Last year I couldn’t even talk to the teachers but now I can talk to the class and the teachers and I can have a chat after class and because now, at home, I usually speak English. It makes me learn English more fast and makes me brave. When I first came here, maybe I was a little worried about if people would be nice to me. I learnt some English before coming to Australia but I could not understand everyone. And now I am better than last year. The EAL staff help me to get better. They are very, very good. My teacher Sonia is very interesting and she really wants us to learn. Sonia is very responsible and kind. I arrived on my birthday. I could feel the fresh air and sunny days and it was very warm. I was excited to go to a new school and study. It was better than what I thought. I couldn’t really speak English. I found the EAL teachers helped me a lot and now my English is getting much better. The EAL teachers are very helpful. Lots of people ask me lots of questions about this school where I come from. I feel very warm and it is a very lovely school. Chris is a also a very good teacher connecting Primary School to High School. 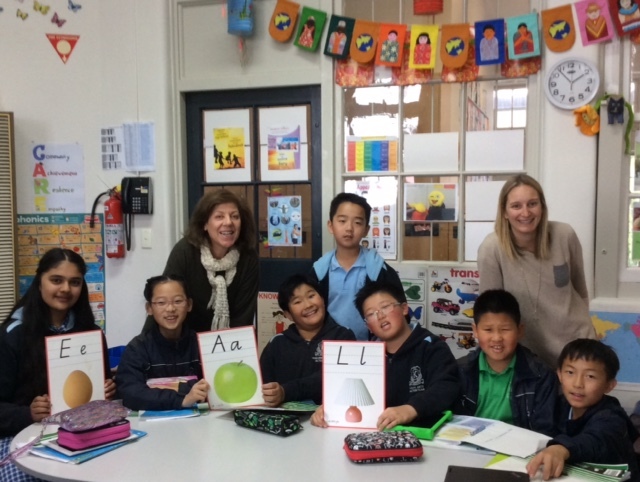 I arrived 3rd week, Term 1, Year 5 and felt very nervous and excited too. I felt their English was better than mine. Now I think most kids’s English is still better than mine but I have improved a lot. The EAL support helped me improve and some classes outside. I feel it is fun at school. The school in China has a lot of homework and I never had a minute to play. Even at Snack and Lunch you had to do homework. At first, I couldn’t understand anything and I felt a bit lonely. I was a bit worried about my English and I went to Language School. My English got better and better. The small books that I read everyday with Ali, Nat and Patricia, they help me understand more words and vocab and grammar. Now I can talk and write. At the start I couldn’t talk or write. Now I have a lot of friends. KPS is a good school because the teachers encourage me to talk in English and they are patient with me. This entry was posted in Learning and tagged EAL by Kate W. Bookmark the permalink.